Tap Gremlins to tap an artifact. 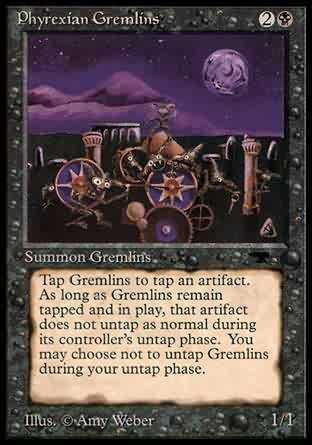 As long as Gremlins remain tapped and in play, that artifact does not untap as normal during its controller's untap phase. You may choose not to untap Gremlins during your untap phase. You may choose not to untap Phyrexian Gremlins during your untap step. T Tap target artifact. As long as Phyrexian Gremlins remains tapped, that artifact doesn't untap during its controller's untap step.